Toronto Blue Jays starting pitcher Marcus Stroman (6) pitches to the Tampa Bay Rays during first inning American league baseball action in Toronto, Monday, Sept.3, 2018. Entering the final month of the season where the remaining games for the Toronto Blue Jays are essentially meaningless, Marcus Stroman said he still yearns to take the mound when his turn comes around. The Blue Jays starter has struggled most of the year with a debilitating blister on his right middle finger, sometimes with good results, often with not. 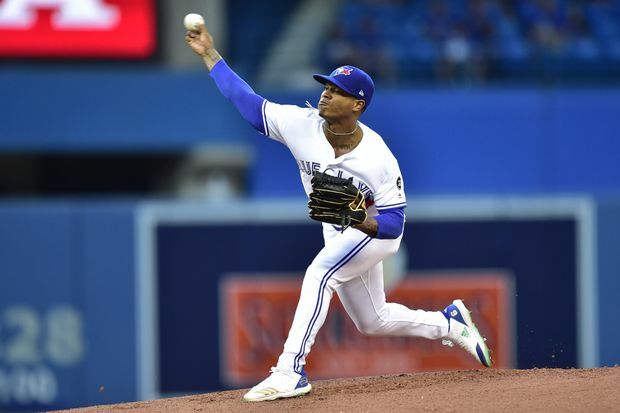 Monday night at Rogers Centre was one of those nights when Stroman could not overcome his blister issue, lasting just 1.2-innings - which tied for the second shortest outing of his career -- as the Tampa Bay Rays breezed past Toronto 7-1. Stroman was shelled for four of the runs through the first two innings where he allowed six hits and also hit a batter before getting yanked. He was returning to the mound after a short stint on the 10-day disabled list nursing the blister, causing him to miss one start. Toronto is now 62-75 on the season and 32 games out of first place in the American League East with just 25 games remaining in the regular-season schedule. With nothing at stake, Blue Jays manager John Gibbons is starting to think it is perhaps time err on the side of caution and shut Stroman down until the finger is fully healed, which could mean his season is at an end. “That’s probably what’s going to happen,” Gibbons said, without elaborating. “I would recommend that, to be honest with you. But I don’t know yet in all fairness to him. When Stroman met with reporters after the game, he was dressed entirely in black and kept both hands jammed deep in his pockets. His mood was surprisingly light but his frustrations at a season gone sideways is clearly weighing on him. “Yeah, just struggling with feel,” said Stroman, now 4-9 on the year. “I didn’t execute the pitches I have, I couldn’t do what I wanted to out there so it’s pretty frustrating. You get the sense when talking to him that he knows the best route is rest. He tries to suppress a smile when he is asked if, given the late stage of the season, perhaps it is time to start focusing on 2019. “I like to compete,” Stroman said. “I don’t like sitting. I mean I only get to play once every five days to begin with so being out there every fifth day is a priority and something that I always want to do. Despite there being less than one month left in the season for the Blue Jays, Stroman doesn’t care. “The last thing I want to do is just shut it down, regardless of how many games we have left or regardless of what the game’s mean,” he said. “I pride myself on going out there with my team every fifth day and competing with my brothers.